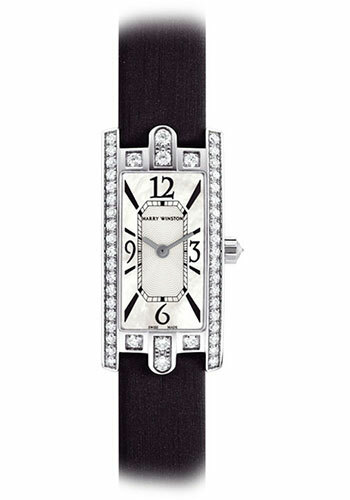 19.5 mm x 38.5 mm 18K white gold case set with diamonds (1.48 carat), mother of pearl dial, quartz movement, satin strap. 19.5 mm x 38.5 mm 18K white gold case set with diamonds (2.44 carat), mother of pearl dial with emerald cut diamonds, quartz movement, satin strap. Harry Winston was a famous American jeweler. He purchased very expensive collections and the re-designed them into more contemporary pieces. After owning the Hope Diamond for a decade he donated it to the Smithsonian Institution in 1958 and also traded the Portuguese Diamond to the Smithsonian museum in 1963. Winston was the first jeweler to loan diamonds to an actress for the Academy Awards. In 2013 the company’s watch component was sold to the Swatch Group. Today the timepiece collection includes: Ocean Sport, Avenue C, Midnight, Premier, Opus Chongraph, and Tourbillon, and the wristwatches are made of steel, white, yellow & rose gold with diamonds, mother of pearl and emeralds.